GET EXPERT ADVICE. GROW YOUR BUSINESS ONLINE. MAKE MORE MONEY. An exclusive online marketing monthly membership club for small business owners & online entrepreneurs like you! this is your last chance to get access to The Hub for 40% off! > Wasting money on ads and resources that are getting you nowhere fast! > Your products and services aren’t exactly flying off the shelves (collecting virtual dust as they wait to be used) because getting in front of your customers has proven to be more difficult than you anticipated. > Your strategy… if we could call it that… is a cluster of “other people's success stories” you’ve gathered along the way (but stringing them together isn’t exactly proving successful). IT TURNS OUT, GROWING YOUR BUSINESS ONLINE IS A LOT HARDER THAN ALL THOSE WEBINARS, FREE TRAININGS, FACEBOOK POSTS AND CLASSES MAKE IT SEEM. It would be great to have someone do it for you, right? Of course, but with a tight budget, the DIY route seems a bit more realistic right now, doesn’t it? Still, you need to get it done, as cost-effective as possible. Without falling down the rabbit hole of the World Wide Web. And, ultimately for (a lot) more success. Here’s the thing ---> to find real growth in business, there’s no ONE thing that provides the results you’re looking for… but instead, it's a collection of strategies that will catapult your business into success. With The Digital Marketing Hub, you finally have a place that skips the “untold secrets” to business and focuses on actual growth with the tools you already have- and maybe some you never knew you needed. > A one-stop membership HUB with every answer you need, brand-spanking new information each month and expert trainings! > Crazy affordable monthly buy in… no other fees, strings or expenses attached! > Flexible for the entrepreneur that studies late at night- or in between client calls. With all the information available whenever- and wherever- you are, you can learn when it makes sense for you. > Perfectly timed content so each month brings you something new… without overwhelming you as you learn. > Trainings on some of the industry’s most sought-after information… and even the hidden gems you might not know to learn about. > Monthly check-in’s in our private Facebook community so can ask questions, get motivated, and refocus on your growing your business. I know it's not polite to talk about money but I just HAVE to. What would it cost for you to hire a digital marketing firm to do this kind of work for you? Hundreds? Thousands? It would cost you a whole lot more than $29 a month (I should know, I charge signficantly more in my own consulting business). So, how can you get the RIGHT information to grow your business online, WITHOUT spending thousands of dollars a month? I got your back, babe. I wanted to make this an affordable place for all levels of entrepreneurs to get access to quality information. I get it, every single dollar that goes out must bring in a return, and your monthly budget to invest back in your business is limited. But, just because you're not ready to hire a full marketing firm, doesn't mean that you don't deserve to learn the RIGHT way to grow your business online. What is more website traffic, a better social media following, lead generating content, and increased sales worth to you? Get all this now for 40% off! Instant access to The Hub for $1 for the first 7 days and then $29/month* after that! p.s take advantage of this offer before it expires! HEY THERE! I'M AMY FIELDS, SO... WHY ME? My passion for marketing started while attending Emerson College in Boston, MA- where I decided to kick journalism to the curb and instead help businesses grow. In 2014 Hub Digital was born, helping budding entrepreneurs and small businesses with all things SEO, social media, ad strategy and online marketing content. (Check out some happy campers below). More often than not, my clients came to me frustrated with all the "quick fixes" they found around the web, and were ready for a strategy that actually worked to grow their businesses. The Digital Marketing Hub is my way of helping EVEN MORE small business owners around the world, giving them access to the tools they need, no matter where they are. We've pulled together the best of the best to bring you full trainings on topics ranging from copywriting to course creation and organic traffic to branding. That's right, I'm sharing some of my absolute best marketing strategies including everything from keyword research, digital advertising, SEO 101 and more. NOTHING is being held back! It's all about support here inside the Hub. If you have any questions along the way, want to bounce around some ideas, orsimply get some confidence boosting encouragement from a like minded community, our Facebook Group is here for you. We all know that feeling, we start the month super motivated to take our marketing up a notch, but quickly become overwhelmed with daily life. Before you give up completely, join us on the 3rd week of every month to review that month's trainings, pick the brains of our guest experts, and ask any questions you have on how to impliment things for your own business. No more searching the internet for hours. All of our current and previous trainings are housed inside ONE membership site for easy access. WANT A LITTLE TASTE OF WHAT'S INSIDE? The guest experts and I cover the gamut inside The Digital Marketing Hub, with topics ranging from keyword research, to Facebook advertising, to email marketing. We believe that creating a truly successful marketing strategy isn't one quick hit. Rather, it's a collection of strategies and techniques that are customized to fit your business, your schedule, and what you've found works for you. Instant access to The Hub for $1 for the first 7 days and then $29/month after that! THIS IS SOUNDING PRETTY AMAZING, HUH? WONDERING IF THIS IS FOR YOU? > You’re willing to invest the time and energy into creating your own marketing program- if only you had some concrete answers to start with. > Flexibility makes you giddy- because we all know how chaotic it is to be an entrepreneur! LIVE courses or scheduled trainings simply don’t cut it when you’re always on the go! > Investing in a large firm to “take over” your marketing isn’t happening anytime soon… so it’s up to you TO DO IT RIGHT! Good thing you’re a self-sufficient, go-getter! > Your business is begging for visibility, growth and the chance to scale! STILL GOT A QUESTION OR TWO? CHECK OUT THE FAQ'S! 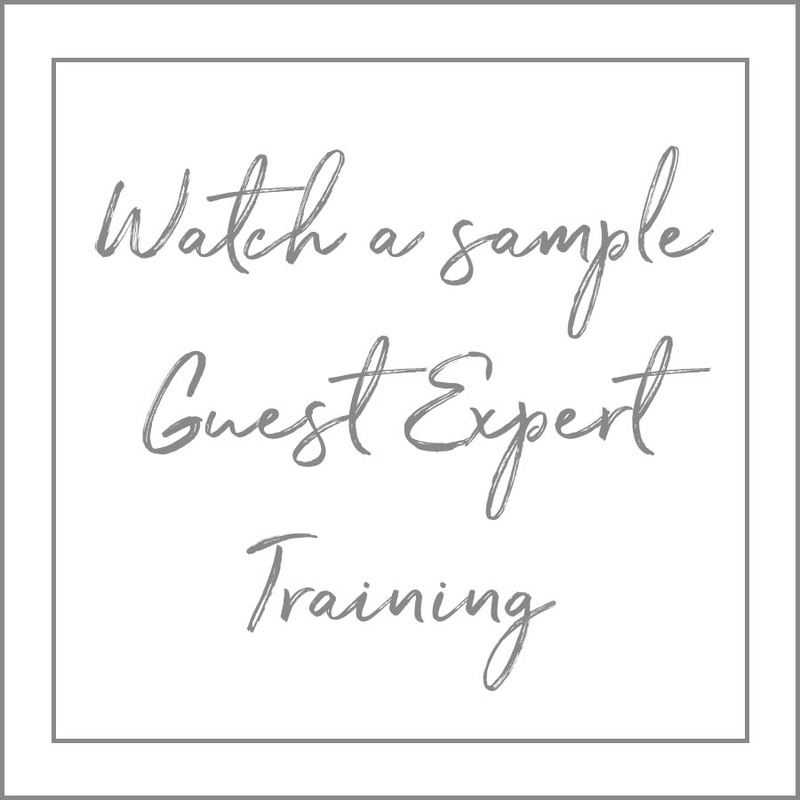 A: With pre-recorded trainings each month- including: 2 guest expert trainings, 1 podcast and 1 master class with me- you can sign into the membership site when it fits in your schedule from any device. Heck, you can even learn from a lounge chair in Cancun- it’s that easy! Q: HOW DO I KNOW IF I'LL LIKE IT? A: Trust me, you'll love it! Not enough to convince you? It's cool! That's why I offer you complete access to the full membership site and all it's goodies for FREE for the first 7 days. A: No way, I’m already married- and that’s as much long-term as I need for one lifetime! Instead, you can cancel at any time since this is a month-to-month membership! Psst: I think you should stick around though! For only $29/ month you’re saving hundreds (if not thousands) of dollars by not hiring a firm to do it for you- and again, the content is ALWAYS changing! A: Heck yes! We have FRESH content each month that delivers something new so it’s never stale- and you’re ALWAYS learning. Would I do that to you? Of course not- but after hundreds of wasted hours scouring the Internet I don’t blame you for asking. After YEARS helping hundreds of businesses grow their online presence I know MORE than a thing or two about online marketing- and I have the stats to back me up. I’ve helped countless entrepreneurs double their revenues and have driven more website traffic than a limo chauffeurs Paris Hilton around. My clients do the talking for me- did you see it? If not, find out what they’re saying - If not scroll back up and see how I've helped their businesses grow. I've done it myself! I've grown a multi-six figure business in under a year, and continue to rank #1 in search, sell out my one-on-one consulting services, and expand my product offerings each year. And as for the guest experts, I’ve either personally worked with them myself in some capacity or another- or have vetted them to the fullest extent! Trust me, no one is leading you down the wrong path on my watch! I'VE HEARD ENOUGH! WHERE DO I SIGN UP? With a “tight on money, abundant in ambition” mindset, The Digital Marketing Hub allows small business owners and entrepreneurs to get the visibility they need without the overhead they don’t. It’s time for your business to take advantage of the tools, resources and trainings inside The Digital Marketing Hub! Stop letting your competitors get all the business- and START getting in front of paying customers today! ONLY $29/MONTH (FREE FOR THE FIRST 7 DAYS) AND YOU'RE ALREADY ON YOUR WAY TO THE RESULTS, GROWTH AND SUCCESS YOU'VE BEEN CRAVING!